Do you enjoy dominating your house like the Trinity killer on Dexter, knowing exactly what each of your family members are doing at all times? 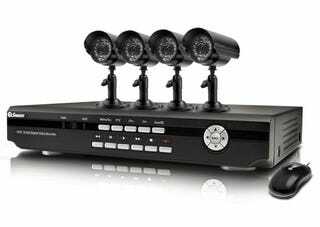 Then Swann has the four camera security system for you. The $700 setup has four cameras, a remote, a 500GB hard drive to record continuously for 30 days, a USB port for backing up said video and even 27 infrared LEDs to enable nighttime viewing.